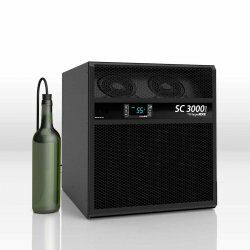 WhisperKOOL SC 3000i cooling unit features a wine cellar cooling capacity of 650 cu. ft. The SC (Self Contained) series will be replacing the XLT product line. WhisperKOOL wine cellar cooling systems incorporate an efficient environmental stabilization system in a compact, easy-to-install, self-contained unit. It is built in a variety of sizes for wine cellars, ranging from 300 to 2000 cubic feet. WhisperKOOL SC wine cellar cooling systems have been purposely engineered with the goal to slide in between standard residential wall stud spacing. This requires a minimum of modification to existing wall structures, and is very easy to place the unit where you want it during new construction of a cellar. TheSC units have a rear flange to directly mount the cooling unit in the wall. The flange allows the unit to be mounted directly in the wall and eliminate the need to build a support shelf. The cooling unit's top angled air flow, allows for better cold air distribution within the cellar. This also allows for more flexibility in positioning the cooling unit within the cellar. During normal operations of the SC cooling the wine cellar, heat is exhausted into the adjacent room. This heat must dissipate away from the cooling unit in order for the unit to continue to function properly. The exhaust must not vent into a closet or a room too small to ventilate the heat. Proper ventilation on the exhaust side of the WhisperKOOL system cannot be overstated. Exhaust or REAR Ducting is available on the SC Units. The WhisperKOOL SC wine cellar cooling system is designed to cool 30°F delta cooler than the ambient temperature of the room/space the unit is exhausting to. If the temperature rises above 85°F then the unit will lose its ability to cool to 55°F in the cellar. Choosing a larger capacity unit to compensate for a poor insulation or greater temperature differential will be ineffective. It is important to choose the right size cooling unit for your cellar. 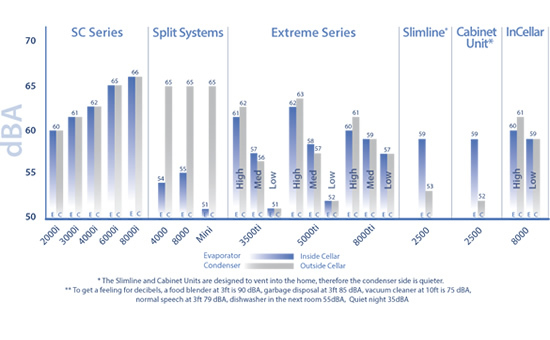 If your conditions are more "extreme" you may require an Extreme Cooling unit and if you are unable to use a wall mounted system please look at the Split System. Both of these series are designed for up to 55 degree temperature differential. This system incorporates a probe designed to measure the liquid temperature in a wine bottle rather than the air temperature of the cellar. This is a benefit as wine is maintained at a precise, measured temperature. Air temperature changes more rapidly than liquid temperature when cellar door is opened. By having the cooling unit calibrated to wine temperature the cooling unit will operate less and extend it's life. Self-calibrating probe- contains a microchip, which communicates back and forth to the thermostat, resulting in greater accuracy. All WhisperKOOL Cellar cooling units are available for shipping within the USA and Canada. WhisperKOOL wine cellar cooling units are American made units produced in Stockton, CA, California, United States, 95205, USA. They are available for full delivery throughout the USA and Canada. Warranty: 2 year parts and labor, 5 years on the compressor. Warranty offered by the manufacturer is for North America Only.